As a home remodeler we get asked often “What will be the best thing to remodel in my house in order to get the most out of it?” Most people would agree, that if your house has structural issues, roof leaks, HVAC problems—get those fixed first. Don’t try to sell a house with a bunch of problems. After all of the major issues are taken care of, now you can think about the items that will make your house look more appealing to a buyer at a higher price compared to your neighbors’ houses. Here are 4 renovations (in no particular order) that will help make your house shine! 1. Exterior Lipstick– people generally start making assumptions the minute they drive up to the house whether they will buy it or not. If your house has a garage door that’s dented in, shrubs overgrown, or paint peeling off it will be harder for someone to get past that even if you have an immaculate interior. Statistics show that garage door replacements, simple landscaping, and siding repair and replacements will give you more bang for your buck when you’re trying to sell your house. To boost curb appeal on the project in the picture we cut down the forest in front of the house, painted the exterior, replaced the roof, and added a picket fence. This changes the whole look of the house! 2. Kitchen Makeover- I may be a bit biased here because there is nothing more fun than tearing out walls in an old house. But I believe that having a more open floor plan makes your house feel bigger which will help it to sell. Opening your kitchen up to the living room or hearth room will make your home feel more spacious and inviting. Countertops are also important. In some neighborhoods plastic laminate tops, such as Formica, won’t make much of a difference for resale. However, Quartz and Granite have quickly become the industry standard in most houses. Even in a 1,000 square foot house, stone countertops can make your house stand out among the rest. 3. Master Bathroom Transformation- The master bathroom is a mysterious one for me. I can shower, brush my teeth, and use the bathroom in a 30 square foot space every day and be fine. However, as a married man I know that women prefer more space in the morning to get ready for the day. For that reason, if you have room to expand, in some cases it may make sense to enlarge your master bath by cutting into your bedroom. 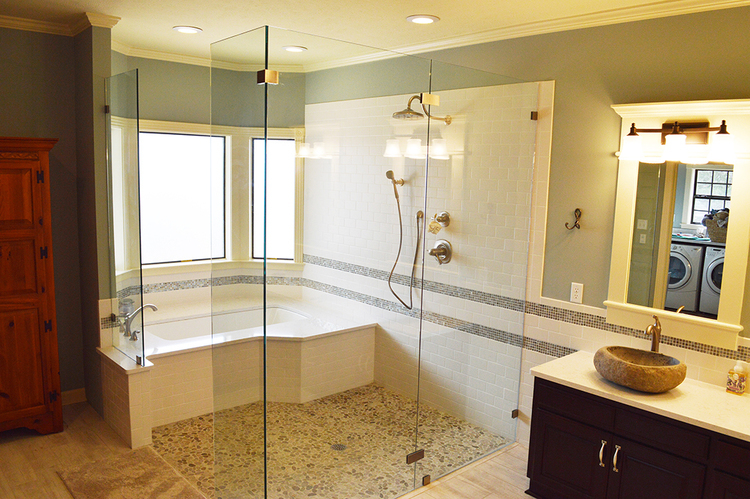 One trend we are seeing a lot is the “smooth transition shower.” We have taken fiberglass showers out and installed smooth transition showers with tile and cultured marble in several of our customers’ houses. For some customers, it’s an absolute necessity due to health issues. For others though, they are planning for the future or what we call “Aging in Place.” They are preparing to be in the house for the last 30, 40, 50 years of their lives, so they plan ahead for the time when they may need a smooth transition shower to keep from having to step over a curb. When you’re getting ready to sell, just remember that you don’t necessarily want to remodel for your own specific tastes, but to the masses that will be looking to purchase your home. If all you do is update your home to fit into current century, your house will be in a much better position when it hits the market.